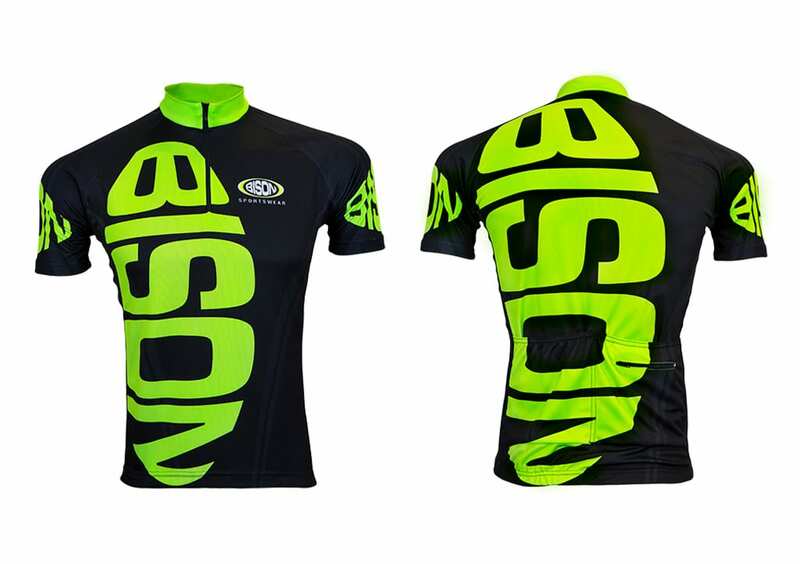 Cycling jerseys, pants, vests, jackets | Bison Sportswear. Do you like cycling trips in your neighborhood or you are not afraid to step on the pedals at the professional level? Either way, with Bison jerseys and clothing, no hill will be steep enough for you. 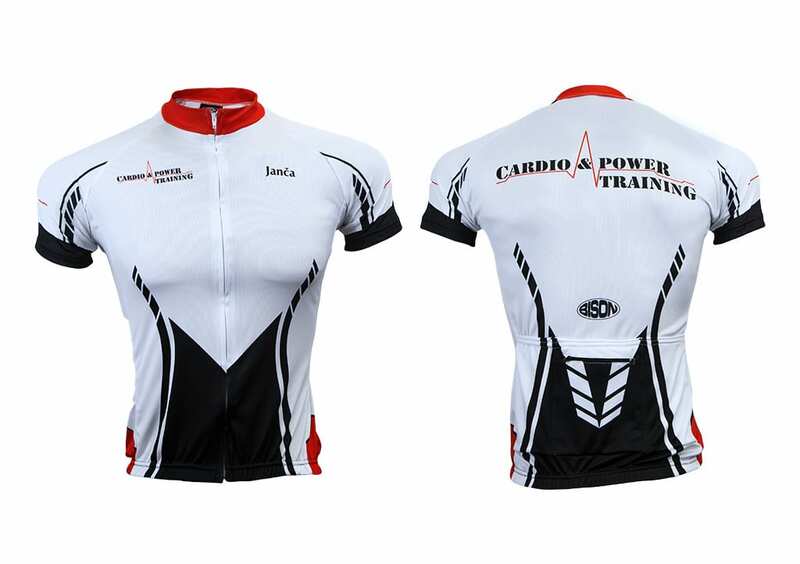 The cycling jersey with short sleeve is manufactured both in men’s and women’s pattern, always anatomically adjusted to the body. 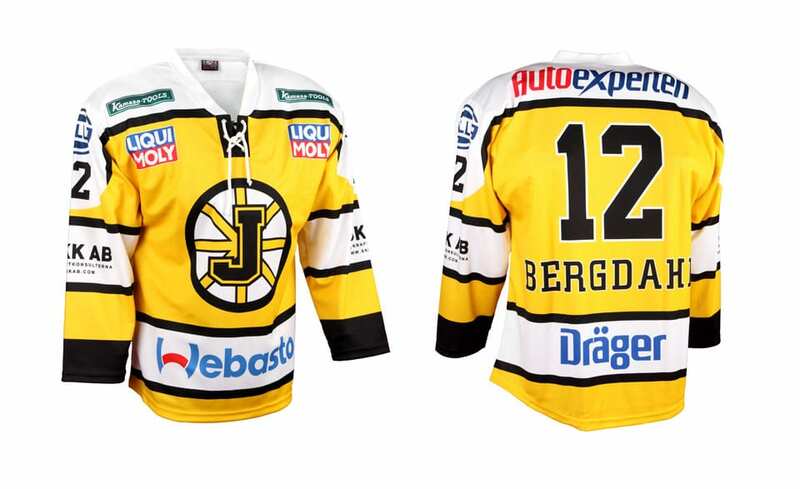 You can choose from several ready-made jerseys. Each model has a design already defined in the basic price, to which the desired material and other additional adjustments for surcharges (long zipper, reflective elements, Flatlock, silicone jersey and sleeve ends, etc.) can be further selected. The most recommended and most frequently used materials for manufacturing jerseys are: CANADA 155 gr., CoMo 160 gr., LION 160 gr., KOSTKA 145 gr., COOLMAX 150 gr. and MINICUBE 150 gr. 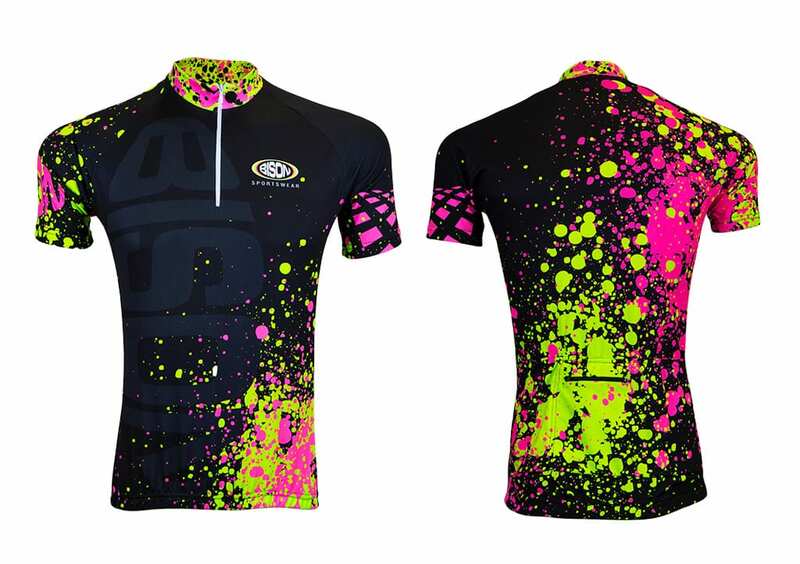 We offer you a MTB-jersey with short sleeve of raglan pattern. It is possible to perform various adjustments on the jersey (hidden or long zipper, zipper pocket, reflective stripes, non-slip rubber and other) according to your wishes. The jerseys can be manufactured from CANADA 155 gr.,CoMo 160 gr.,LION 160 gr., KOSTKA 145 gr., COOLMAX 150 gr. and MINICUBE 150 gr. materials. CANADA 155 gr., CoMo 160 gr., LION 160 gr., KOSTKA 145 gr., COOLMAX 150 gr. and MINICUBE 150 gr. The basic pants size can be determined using size tables. More information about materials can be found here. Information on the price can be found in the price list. Cycling jackets are manufactured from membrane material in the summer and winter design. The most frequently are used following materials: KOSTKA 230 gr., TOURLIGHT, TOUR and OUTS. Jackets have very well-fitting raglan pattern with back extension. The jacket also has an adjustable elastic band at the waist. The sleeves contain Knitted parts. Jackets can also be adjusted according to your wishes. We apply reflective stripes, anti-slip rubber and pockets for the back part, etc. on the jackets. The basic jackets size can be determined using size tables. More information about materials can be found here. Information on the price can be found in the price list. Cycling vests are lightweight, very well fitting in terms of pattern and practical. A light breathable mesh, suitable for changing summer weather, is used on the back. Vests are very popular for their excellent storage, low weight, reflective stripes, three back pockets and a long zipper in the front. Furthermore, the vest can be adjusted according to customer’s wishes (zipper pocket, anti-slip rubber). The basic vests size can be determined using size tables. More information about materials can be found here. Information on the price can be found in the price list. Our offer also contains a jacket with detachable sleeves from a membrane material in the summer and winter design. The most frequently used materials are: TOURLIGHT, TOUR and OUTS. Cycling jackets have very well-fitting classical pattern with back extension. The sleeves are attached with a zipper that has top and bottom overlays. The jacket also has an adjustable waistband, a reflective stripe on the back part, where a pocket is also placed. The sleeves contain knitted parts. 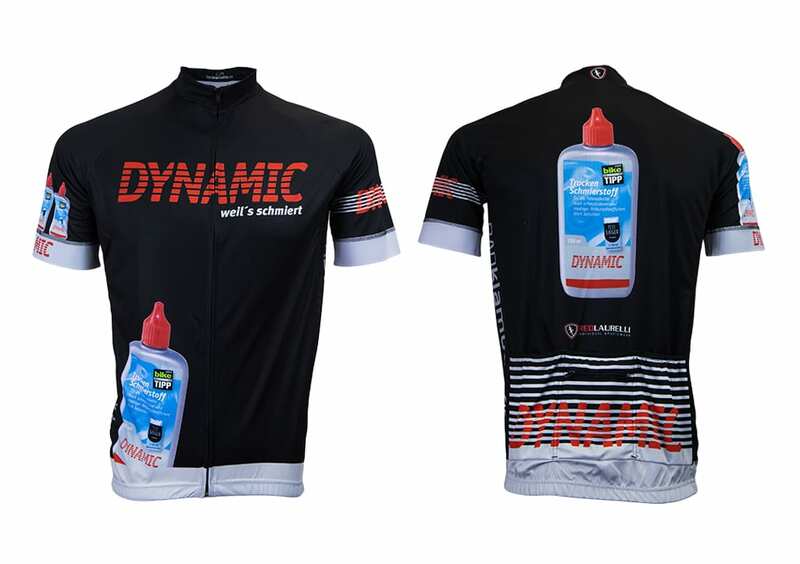 Cycling jersey for recumbent bicycle with detachable sleeves represents an interesting option to use the universal jersey. The pattern is specially adapted for use on the recumbent bicycle. The jersey has short sleeve, with the possibility to clip the long sleeve thus obtaining the jersey with long sleeves. The sleeves contain knitted parts. There is a pocket on the front part. At the end of the jersey there is an anti-slip rubber, preventing the jerseys from curling up. The most frequently used materials are: CANADA 155 gr., CoMo 160 gr., LION 160 gr., KOSTKA 145 gr., COOLMAX 150 gr. and MINICUBE 150 gr. Cycling leg warmers from lightweight material avoids cold and can be used mainly in the summer period. The leg warmers are lightweight and the material, which is pleasant by touch is allowing full sublimation printing, thus perfectly matching the design to your jerseys. Cycling leg warmers from thermal (warm-up) material are ideal for colder autumn periods. The ends of the both leg warmers are made of high quality anti-slip rubber. The leg warmers can be easily folded in the back pocket of the jersey, where you can keep them at your fingertips. The basic leg warmers size can be determined using size tables. More detailed information about materials can be found here. Information on the price can be found in the price list. Cycling hand warmers from lightweight material avoids cold and can be used mainly in the summer period. The leg warmers are lightweight and the material, which is pleasant by touch is allowing full sublimation printing, thus perfectly matching the design to your jerseys. Cycling hand warmers from thermal (warm-up) material are ideal for colder autumn periods. The ends of the both leg warmers are made of high quality anti-slip rubber. The leg warmers can be easily folded in the back pocket of the jersey, where you can keep them at your fingertips. The basic hand warmers size can be determined using size tables. More detailed information about materials can be found here. Information on the price can be found in the price list. The multifunctional tube fire scarf is a suitable supplement for most outdoor sports. It is manufactured from elastic polyester micro-fibre which is soft and pleasant to touch. It does not cool you and does not absorb the sweat, on the contrary, it takes it to the surface. The scarf is a lightweight and flexible. Its size is universal and it will adapt to all users. The multi-tube scarf protects you in all weather conditions against sun, winter, sweat and dust. Pokud si nevyberete žádný model dresu nebo oblečení z naší nabídky, nebo požadujete dresy v originálním designu,můžeme v našem grafickém studiu společně s vámi vytvořit dresy podle vašich představ. Příprava grafického návrhu je zdarma. Samostatná výroba se vždy uskuteční až po odsouhlasení vzorků nebo tiskových náhledů. V případě ztráty nebo zničení vašich současných dresů vám rádi zkompletujeme neúplné sady zhotovením podobných dresů tak, abyste i nadále mohli tyto dresy používat.